Ask fellow campers about "Chimney Rock Pioneer Crossing" and nearby attractions. Small CG With 14 Sites. Very Quiet & Peacefull With Long Pull Throughs. Front Window View is Chimney Rock National Historical Site about 1/2 Miles Away. Received Dish Satellite, AT&T Cell & 5 bars of 4G Service. Shore power was good. There are no amenities like laundry, showers or Restrooms. I really do not have any complaints but it is over priced for what you get. We camped at Chimney Rock Pioneer Crossing in a Motorhome. Spent a week here with my telescope and cameras to photograph the dark skies. The owners were friendly and accommodating. I was able to get good pictures. Hope to come back again sometime and encourage fellow amateur astronomers to visit. We camped at Chimney Rock Pioneer Crossing in a Motorhome. Next door to Chimney Rock. This is a fantastic campground. The staff is is very attentive, happy and genuinely concerned that you have an excellent experience when staying here. The bar is great as well as the food. Hamburgers, pulled pork sandwiches, corn on the cob, EJell-O shots and Margarita lime wedges are a must try! The cost was higher because it was the Solar Eclipse. We camped at Chimney Rock Pioneer Crossing in a Fifth Wheel. All hookups in good shape. Tornado had hit day before we arrived so had no power when we arrived. It came on later in evening.didnt charge us full rate because of not having power. We camped at Chimney Rock Pioneer Crossing in a Fifth Wheel. The rate was $325/month plus electric. Small RV park, very close to Chimney Rock. Beautiful views and sunsets. Rural country setting. Friendly owners. Good water pressure, full hook ups. No wifi. Gravel roads and sites. Easy in and out. Nice little store that has good food (burgers, sandwiches, ice cream) and beer available. Lots of guests were working nearby, others stop through for a few nights just visiting. The park stayed fairly full the entire month we were here. There is a horse, 2 donkeys and a herd of cattle that live on the property also. We camped at Chimney Rock Pioneer Crossing in a Fifth Wheel. The store/office sells food (burgers, ice cream, coffee, beer) and some souvenirs. Watch out for snakes! And bring plenty of bug spray, the mosquitoes are relentless! No WiFi, some TV reception on the Antenna. Rustic, beautiful views of Chimney Rock which is within walking distance and lighted at dark, very nice. Beautiful sunsets, horses and donkeys running around in the meadow. Owners live on the property and are very friendly and helpful. Great stop if you visit the park and Scottsbluff National Monument. The only bad thing is the train! Came down the track (running behind the rv park) four times a night during our stay. We camped at Chimney Rock Pioneer Crossing in a Fifth Wheel. Scotsbluff National Monument, a 30 minute drive. Very basic 'rural' park but plenty of room for pull-throughs. Owners advised us what site to take when we rang and collected our money later. Lovely people and very hospitable. This is 'no-frills' but offers lovely view of Chimney Rock, which is lit at night. Bugs and wasps were plentiful but also manageable! Stayed 2 nights to sightsee area. Trains run right by but we only had about 4 all through the night so quite bearable. Very peaceful otherwise. Would stay here again. Did not use amenities and shop had already closed for season. Level gravel site. Camped in 38ft motorhome with tow. We camped at Chimney Rock Pioneer Crossing in a Motorhome. Chimney Rock Museum and Information centre only 1/2 mile up the road. Worth a visit and also Scottsbluff. Just stayed here one night en route. Great view of Chimney Rock from our trailer window. This isn't a fancy campground but very sufficient. Office personnel was friendly and helpful. Would stay here again. We camped at Chimney Rock Pioneer Crossing in a Fifth Wheel. This was our third time to stay here over the past 5 years. It was raining when we arrived, had been for a couple of days. Interior roads are good gravel (our coach did not sink nor make ruts) and lawns between sites are beautiful. Park owner checked us in; he went "way beyond his job description" to make us welcome. This park is immediately north of Chimney Rock; the spire is lighted at night and makes for a fantastic view from our RV. We highly recommend this park for a night or a week for a quiet, relaxing time surrounded by nature and nurtured by great camp hosts/owners. We camped at Chimney Rock Pioneer Crossing in a Motorhome. There is a great pioneer museum and a good hike at "the rock". A short drive away is Scottsbluff, another great hike. Stayed one night passing through. Arrived on Sunday and office was closed but owners putting fence back up to keep the horses in. Owner pointed out the site and said she would get with us later to settle up. Very pleasant people. Campground is at base of Chimney Rock which is lit at night, which was pretty in a barren way. As the campground is in "very" rural semi desert be prepared for bugs at sundown - - - LOTS OF BUGS! Relatively small and tight campground with what appear to be a majority of long term residents with considerable "stuff" lying around numerous sites, creating a shabby and unkempt appearance. We camped at Chimney Rock Pioneer Crossing in a Fifth Wheel. No one around, we weren't sure it was even open. No Shade with gravel pads. You are on farm ground that they made into an RV Park. Expensive for what you get and yes, they even charge for the use of the shower. Railroad tracks nearby as well. We will pass this one by next time. We camped at Chimney Rock Pioneer Crossing in a Travel Trailer. A horrible campground. Avoid this place. Poorly managed, and they charge for everything to include the use of the restroom! Zero shade, no trees, lots of mosquitoes and a nice view of a cow swamp. Rude owner/staff. Don't waste your money. The only thing worth the effort is the nearby visit to Chimney Rock. We camped at Chimney Rock Pioneer Crossing in a Motorhome. This was beautifully cared for, nice grass on each site, wonderful setting. No trees, it is on the prairie. Can see chimney rock from campsite. Wonderful people, must stay if in the area to see the "rock". 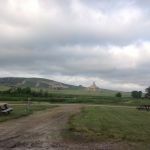 We camped at Chimney Rock Pioneer Crossing in a Travel Trailer. 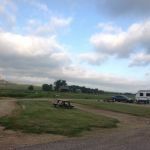 We really liked this RV Park, small but the view of Chimney Rock is right in front of you. All sites are level and pull through. The owner was very friendly. There are a number of coal trains that go by and blow their horns at crossings close to the park during the day and at night, but they did not bother us. They have a small store that the owner was cleaning up and getting ready for the summer season. She said they have a liquor license and was thinking of having a margarita night. She makes homemade waffles used for ice cream cones but we were there too early to sample. We would stop again because of the fantastic view. Also should note that this is close to Scotts Bluff National Monument about 20 miles away. 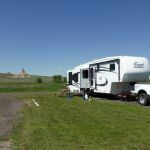 We camped at Chimney Rock Pioneer Crossing in a Fifth Wheel. 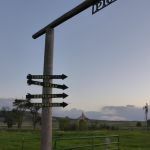 Are you affiliated with Chimney Rock Pioneer Crossing ?